Take action to help K-12 schools provide all students with physical education and before, during and after school physical activity opportunities – because Active Kids Do Better! Share and engage in Active Schools’ vision to reimagine school environments to provide opportunities for academic, social, emotional, and physical learning so that all children have the ability, confidence, and desire to lead active, healthy lives. 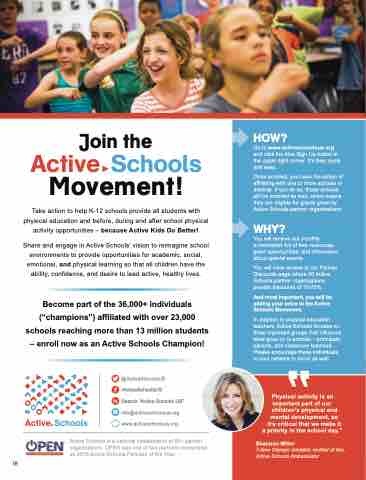 Become part of the 36,000+ individuals (“champions”) affiliated with over 23,000 schools reaching more than 13 million students – enroll now as an Active Schools Champion! Active Schools is a national collaborative of 90+ partner organizations. OPEN was one of two partners recognized as 2018 Active Schools Partners of the Year. Go to www.activeschoolsus.org and click the blue Sign Up button in the upper right corner. It’s free, quick and easy. Once enrolled, you have the option of affiliating with one or more schools or districts. If you do so, those schools will be enrolled as well, which means they are eligible for grants given by Active Schools partner organizations. You will receive our monthly e-newsletter full of free resources, grant opportunities, and information about special events. You will have access to our Partner Discounts page where 20 Active Schools partner organizations provide discounts of 10-75%. And most important, you will be adding your voice to the Active Schools Movement. In addition to physical education teachers, Active Schools focuses on three important groups that influence what goes on in schools – principals, parents, and classroom teachers. Please encourage these individuals in your network to enroll as well.